These 10 minute videos feature renowned malaria specialist Saw Marcus Winn. Saw Marcus is an eminent etymologist who has worked in on malaria projects in Myanmar all his professional life. 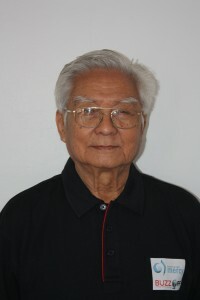 Currently he is the Deputy Director of the Myanmar Council of Churches Malaria Project. Saw Marcus is a big fan of Buzz Off and has been working with since we began running seminars in greater Myanmar in 2009. The ten videos are based around 10 basic questions that we try to answer in the malaria seminars. 1. Where does malaria come from? 2. Why the female anopheles mosquito? 3. How can a village control malaria? 4. How does a healthy diet helps prevent malaria? 5. Ways to diagnose malaria. 6. How a person can protect themselves from malaria. 7. Malaria, pregnant women and children. 8. What are the treatments for malaria? 9. Types of malaria and other mosquito borne diseases. 10. Can a person be immune from malaria? As far as we are aware this website is only Burmese language malaria site in the world. In the coming months we plan to make these same messages available in other Burmese languages such as Karen, Chin, and Wa. These videos and the setting up of this site have been made possible through the generous donations of a Singapore based charity that wishes to remain anonymous. Donations to Buzz Off can be made through the Australian Mercy secure site .